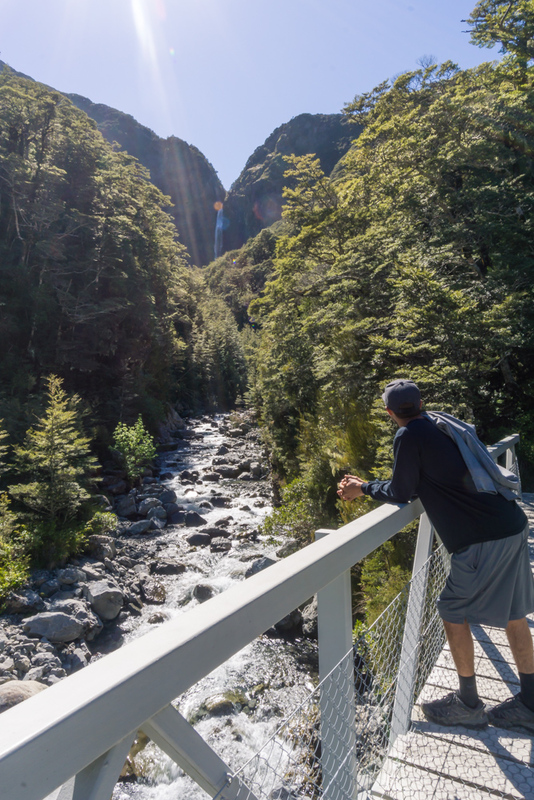 Whether you're staying overnight at Arthurs Pass or passing through on your drive around the south island of New Zealand, you should consider stopping and walking to this impressive 430 foot tall waterfall cascading off the side of a canyon wall. This is my favorite short hike in the area and can be easily completed in less than an hour! Click here for our entire 10 day south island New Zealand itinerary! Even from the parking lot, you can already spot the enormous falls in the distance. Once you start on the trail, the path crosses several footbridges heading towards the falls. A quarter mile in we reached the second bridge where the falls already look closer. The trail then enters a lush and mossy forest and starts climbing up and over the small ridge. We continued along a small use path to get a closer look to the falls. Everything past the platform was incredibly slippery, as each step closer to the falls meant getting more and more soaked. The waterfall really is an impressive sight, and you can really feel the force of the water falling 400 feet this close. After we were thoroughly soaked and chilly from being in the shade of the canyon wall, we headed back to the platform. If you want to see the waterfall in the sun, hike later in the day since the waterfall was still in the shade when we hiked in the morning. On our way back, we veered off the trail to explore some of the lush beech forests. Of all the native forests in New Zealand, Beech forests make up the largest remaining kind, and the beech trees here are quite beautiful. This short hike was the perfect way to start off our day as we got back on the road to head back to Christchurch, completing our 10 day road trip around the south island.